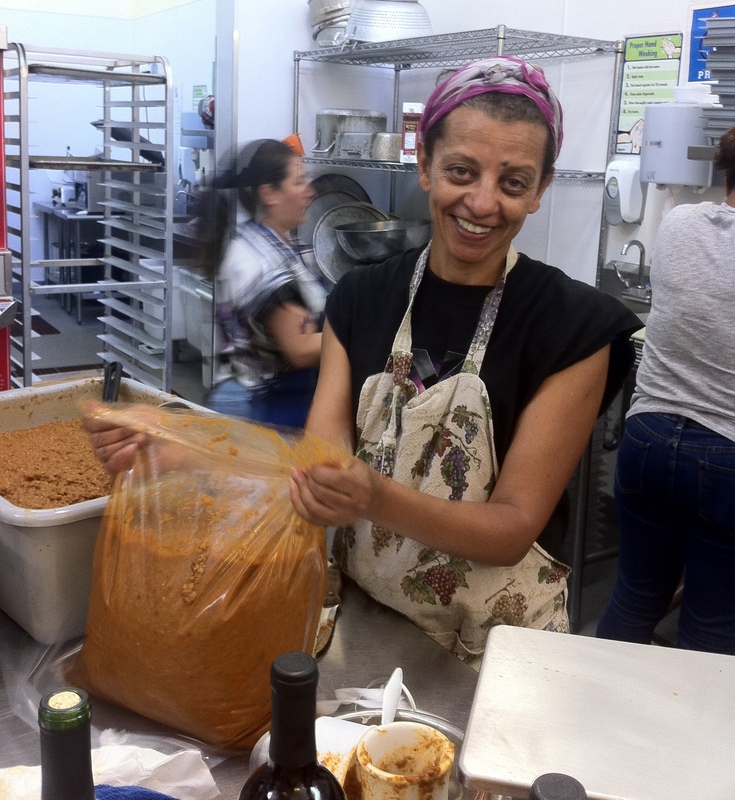 Eji moved here from Ethiopia several years ago, but only this year decided to harness her Ethiopian cooking skills and love of food to start her own business. She grew up cooking in a family of eight children, including five daughters for which cooking with mom was a mandatory activity. She always liked vegetarian dishes and decided to make her business 100% vegan. Eji joined the La Cocina incubator program in February and “it’s been go go go since then.” In preparation for her official launch at the SF Street Food Festival this weekend, she’s been spending as many hours in the La Cocina kitchen as she can manage. Her friends and sister have come to help volunteer and she’s taken advantage of the volunteers coordinated by La Cocina. This weekend will be her first public event and she’s excited. She served me a sample of what she’ll serve at the festival, and it was fantastic: lentils cooked with loads of carmelized onions and marinated in a blend of Ethiopian spices: cardamom, cumin, berbere (Ethiopian red chili mixture), and ten other spices that her mom makes in Ethiopia and sends to her here in San Francisco. That’s some serious authenticity. She’ll serve the lentils with injera (Ethiopian flat bread), and she’ll also be offering stir fry cabbage with carrots as well as chickpea cakes. Where to find Eji’s: this weekend at the SF Street Food Festival for her official launch!! Thanks for the invitation! Unfortunately a bit too late notice for me, but good luck with the event!